The renowned Hornbill Festival, named after the bird, is one of the largest celebrations of the indigenous warrior tribes of Nagaland, in India's far north east region. The hornbill is particularly revered by the Nagas and is reflected in tribal folklore, dances and songs. It was in the year 2000, that the State Government desirous of promoting tourism embarked upon an ambitious project to exploit the cultural assets of Nagaland, through a weeklong long festival to coincide with the celebration of Nagaland Statehood Day on 1st December. Thus, the inception of the Nagaland Hornbill Festival so named in collective reverence to the bird enshrined in the cultural ethos of the Nagas to espouse the spirit of unity in diversity. When is the Hornbill Festival? The Nagaland state government started the Hornbill festival in 2000 to showcase the state's culture. It began as a week-long festival to coincide with Nagaland Statehood Day on December 1 each year. However, in 2013, the festival was extended for a few extra days due to its popularity. It now runs from December 1-10. Most of the festival activities take place at Kisama Heritage Village, not far from Kohima (the capital of Nagaland). Kohima is best reached by road from Dimapur (where the nearest railway station and airports are located). The journey takes about two to three hours. Alternatively, it's an eight or nine hour drive from Guwahati in Assam. Taxis are readily available from Kohima to Kisama Heritage Village. Do ensure that the vehicle has a pass to park at the venue. The Hornbill Rock Contest, which happens in the evenings after sundown, has been held in Dimapur the last couple of years. Around 20 bands take part and compete. What Happens at the Hornbill Festival? The festival is organized by the state government and is attended by all of Nagaland's major tribes. It features traditional arts, dances, folk songs, and indigenous games. All this takes place amid immaculate replicas of tribal huts, complete with wood carvings and hollow log drum instruments, which are beat in haunting symphony at the end of the day. There are plenty of handicraft stalls, food stalls (smoked pork is a local delicacy), and heady rice beer to enjoy as well. Plus, a film festival, adventure activities, and kids' carnival. However, the hottest event (literally!) at the festival is undoubtedly the Naga chili eating competition! The Hornbill Festival is one of the top tourist draws in Nagaland, so if you're planning to attend, do book accommodations well in advance. Alternatively, if you want to avoid the traffic congestion from Kohima to Kisama, consider staying in Kigwema village. It's within walking distance of Kisama, is much less-crowded, and has comfortable facilities for tourists. Expect to pay 2,500-3,000 rupees per night for a double. Try Lalhou's Homestay, Greenwood Villa, or Vicha Guesthouse..
Another option is to camp. Kite Manja provides the only campsite inside the festival gate, just 100 meters from the main festival arena. Camping starts from November 30, for those who want to catch the opening ceremony the next morning. Facilities include tents, sleeping bags, eco-toilets, water, common area, phone charging points, and kitchen. It's the "happiest campsite" with bonfire, jamming, and other activities. Greener Pastures conducts an eight-day tour to the Hornbill Festival every year. 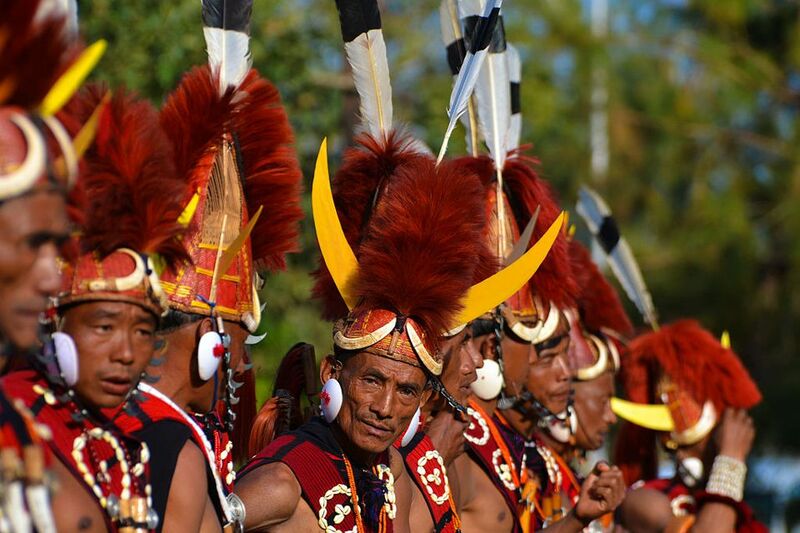 Check out this seven-day Nagaland and Hornbill Festival tour offered by The Holiday Scout as well. Kipepeo is also running a recommended eight-day tour to the Hornbill Festival. All are reputable organizations. Those wanting to photograph the festival may be interested in this photography tour offered by Darter Photography in partnership with local travel company Gypsy Feet. It includes visits to neighboring villages of the Angami tribe, Kaziranga National Park, and Majuli Island. If you'd like to stay in style (think glamping! ), don't miss the luxurious Ultimate Traveling Camp. They offer itineraries of various lengths. There's a very handy Information Center next to the festival venue, which provides brochures listing the events at the festival and other attractions in Nagaland. Make sure you bargain at the souvenir shops. Entry permits are no longer necessary for foreigners visiting Nagaland. However, foreigners will need to register themselves with the Foreigner's Registration Office (District Superintendent of Police) within 24 hours of entry into the state. Indian tourists need an Innner Line Permit. This is available from any Nagaland House. Kisama Heritage Village is usually only about a 20 minute drive from Kohima. However, heavy traffic during the Hornbill festival can increase travel time to an hour and a half. Make sure you plan accordingly.